Fenner Brockway was a British anti-war activist, politician and humanist. Born in Calcutta, India, Brockway attended the School for the Sons of Missionaries, Blackheath (now Eltham College) 1897-1905. As editor of the Labour Leader, newspaper of the Independent Labour Party, he was arrested three times during the first world war. First for publishing seditious material for which he was acquitted. 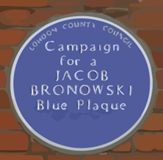 Second for distributing anti-conscription leaflets for which he was gaoled in Pentonville Prison for two months after refusing to pay a fine. Third for refusal to be conscripted, after being denied recognition as a conscientious objector, for which he was court-martialled and imprisoned until 1919. He was held for a night in the Tower of London, in a dungeon under Chester Castle and finally in Walton Prison, Liverpool. During the Spanish Civil War and the Second World War he supported armed resistance to fascismbut continued to serve as Chair of the Central Board for Conscientious Objectors until his death. He was a Labour MP for Leyton East 1929-31 and rejoined the Labour Party after the war to become MP for Eton and Slough from 1950-64 and then accepted a life peerage. He was a founding member of the charity War on Want and the Campaign for Nuclear Disarmament. He proposed legislation to end racial discrimination and chaired the Movement for Colonial Freedom. He was a member of the advisory council of the British Humanist Association. A statue of Fenner Brockway stands at the entrance to Red Lion Square, Holborn, London.